But the strategic interest of the U.S. does differ from Pakistan's. A completely U.S. controlled Turkmenistan-Afghanistan-Baluchistan pipeline would be nice. To advert an Iran-Baluchistan-India pipeline would help U.S. interests against Iran and to deny China access to the Arabian sea checks the upcoming competitor. I now expect a "Free Baluchistan Act" to be on next years congressional agenda. I was wrong with that expectation but only by six years. [Congressman Dana] Rohrabacher now has teamed up with intellectual titans and foreign policy experts Steve King (R-IA) and Louis Gohmert (R-TX) to submit H. Con. Res. 104 on Friday, calling for an independent Balochistan. Jim finds that the Pakistanis ain't happy with that. There is also news about that pipeline from Iran through Baluchistan which the U.S. does not want to be build. Russia's Gazprom is now offering to finance and build it. That threat will help Rohrabacher to find more co-sponsors for his bill. As the U.S. still needs Pakistan in Afghanistan their Rohrabacher's resolution may well fail, but I am certain that the issue will one day be back on the agenda. If that idiot Rohrabacher and his band of morons back sovereignty for any nation, it will have to be dominated by US policy. It is amazing when you think about it. It is like these guys think up scenarios that will inflict maximum possible damage, and run with it. As I recall the war in Afghanistan ain't over yet. Don't we still need Pakistan? Could this be a BOGOF? Balochistan includes parts of Afghanistan and, more importantly for neo-cons like Rohrabacher, most of south-east Iran. With Balochistan an American satrapy, the "mission" in Afghanistan is a lot easier, and Iran loses its open access to the Arabian Sea. I am assuming this may be more about the closing of US access to the base in Baluchistan from which drones were flying. That is not to say there isn't gross injustices being done to the Baluchi's in Pakistan but US only makes injustices a cause if there is some US interest at stake otherwise it is like Bahrain, easy to turn a blind eye. If 'freedom' comes to Baluchistan I doubt many Baluchi's will be able to tell the difference. It is high time that Pakistan's Parliament looked at the need for a Free Texas (Arizona and New Mexico too) resolution. As to the continued occupation of Iowa by genocidal colonists of European origin this is a matter the International Community has ignored for far too long. yeah, it seems the people who design this feel safe where they are and enjoy the watch. One investigation by the New York Times found that NATO bombs killed as many as 70 civilians during the conflict, including 29 women and children. Survivors told the Times that one tactic used by NATO was to restrike targets minutes after the first attack, a practice that killed civilians rushing to aid the wounded. @ bevin, #5 Very funny! I needed a chuckle this morning. Best to you and all the readers/posters here. B especially. Great work, B. Over the last two months, a small faction of Congressmen has laid the foundation for an alternative Afghanistan-Pakistan policy. They do not favour strengthening relations with the Pakistan government nor do they accept normalising relations with the Taliban, if it leads to Pashtun dominance in Afghanistan. Instead, they propose backing remnants of the Northern Alliance seeking to establish semi-autonomous provinces in Afghanistan and Baloch nationalists hoping to create an independent state of Balochistan. In-speaking with those following the Berlin faction in Congress, the general sentiment is that the introduction of the new Balochistan bill is not their final move. They almost certainly will continue to pursue support for both the Northern Alliance and Baloch nationalists regardless of whether or not they can garner support for the new bill. Such efforts are likely to further frustrate the Obama Administration, State Department, and Governments of Pakistan and Afghanistan as they seek to work together on policies for the region post-US troop draw-down. However, it is unlikely that the Berlin faction will accept just frustrating the administration. Instead, they probably will seek to seriously challenge the administration on its AfPak policy record using Balochistan as the lever. This could present a major challenge to the status quo powers involved, especially in a presidential election year in the United States. Alot to talk about here. They almost certainly will continue to pursue support for both the Northern Alliance and Baloch nationalists regardless of whether or not they can garner support for the new bill. This is part of "The Blackwill Plan" named after former Indian Ambassador, and Assistant Secretary of State, neo-conservative Robert Blackwill. Last year in Foreign Affairs he proposed this plan with an essay titled "Plan B in Afghanistan". Calling for an independent Balochistan, a NATO garrisoned Northern Afghanistan for the Uzbek, Hazzari, Tajik minorities and a Pashtunistan seperate from either Pakistan or Afghanistan that would be kept in line via drones. Of course the idea of a independent Balochistan is not new for America. 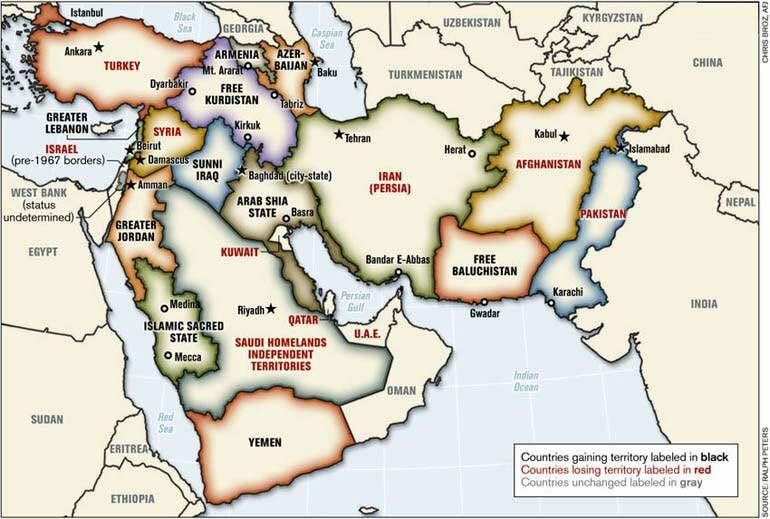 The famous 2006 map redrawing the borders of the Middle East from the US National War Academy, also featured a free Balochistan, tiny Pakistan. Curiously it also had a "Greater Lebanon" that encompassed Lebanon and up the coast into the Alawi parts of Syria (including Tartus) landlocking the new Syria. So "resource rich" means location for a pipeline, does it? I would have thought there was nothing in Baluchistan except a desert. The Afghan part of the pipeline isn't going to work, as US control of Afghanistan is decidedly weak, even of the west. Such a pipeline might work for a couple of years, but not more, before being blown to pieces. What this is about is breaking up Pakistan, surely. Afghanistan, too, according to 10. Standard policy, invented in Israel. Break up Muslim powers into warring statelets. Then they're no longer a risk. Not a path to stability though. We shouldn't expect wisdom of the US Congress. Plans to partition Afghanistan are very old. Lord Lytton, for example planned to establish a British puppet in Kandahar, give Herat to Iran and leave Kabul to an independent Afghan ruler. US policy is largely contrived by semi-literate geeks who owe their jobs to neo-con gangster/politicians, which is why it invariably fails. Failure, however, is obscured by the enormous amount of blood shed by the US. Hence the general view in the States that the war in Iraq was a victory, spoiled only by the diabolical ingratitude of the people allowed to huddle together in the ruins of their cities, despite the suspicion that they are unfriendly to the zionist project and, therefore, liable to summary execution. @12 Balochistan hosts the deep water port of Gwadar, natural terminus of pipelines from the Caucasus, the Caspian and...? It's a fabulous prize. It will allow Iran to be bypassed and force the Chinese to deal with the West instead of count on pipelines of their own across Central Asia. Leastwise that's the impression I get with a cursory glance at my Atlas. "Perhaps we should even consider support for a Balochistan carved out of Pakistan to diminish radical power there also." Welcoming a recently tabled bill on Balochistan in the United States’ House of Representatives, Baloch Republican Party’s self-exiled chief Brahamdagh Bugti expressed his support on Wednesday for any and all foreign intervention in the province whether it be by the US, Nato or India. A resolution was introduced on February 17 by Congressman Dana Rohrabacher and co-sponsored by two other congressmen in the US House of Representatives, calling upon Pakistan to recognise the right to self-determination for the people of Balochistan.